The ultimate desktop video magnifier, TOPAZ XL HD provides high-definition magnification with the sharpest image and the crispest text, allowing for low magnification levels that fit more text on the screen for faster reading and better comprehension with less fatigue. TOPAZ XL HD is the video magnifier of choice for those looking for maximum productivity in work and school environments. 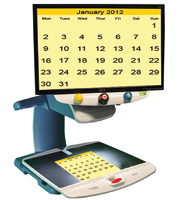 The TOPAZ XL HD brings you the most versatile desktop video magnifier available. The sharp image with high-contrast text, vibrant colors, and rich black and white, allows the TOPAZ XL HD to offer the lowest magnification (1.5x) and widest field of view of any desktop video magnifier. Many users find they can display an entire page of text in high contrast across a widescreen monitor and read without moving the reading table from side to side. This means less fatigue, faster reading, and better comprehension. Connect your TOPAZ XL HD to your PC, and, with the addition of GEM and OpenBook Scanning and Reading Software, a single keystroke will send a high-definition image from your TOPAZ XL HD to OpenBook, which automatically performs OCR and begins reading aloud. Scan multiple pages as one document, edit the document, and save it. OpenBook formats multiple columns as a single column on your screen for continuous reading. You can change the font size and colors and even print out a copy with your enhancements, or save it as an MP3.